The ICP DAS USA ET-7200 series Modbus TCP Based Dual Ethernet Port Data Acquisition I/O Modules are similar to our ET-7000 modules, but each module has 2 Ethernet ports for daisy-chain networking configuration and can work with standard Ethernet switches for monitoring and control applications. The daisy-chain typology allows for easier cabling and saves your cost on Ethernet cabling and switches. As remote web-based Ethernet I/O modules, the ET-7200 series also features a built-in web server which allows you to configure your devices and monitor your systems simply through a regular web browser. Users can create dynamic web pages for I/O monitoring and control without programming or HTML skills. The ET-7200 Dual Ethernet Port modules support Modbus TCP protocol for seamless integration with SCADA software and your current data acquisition systems. 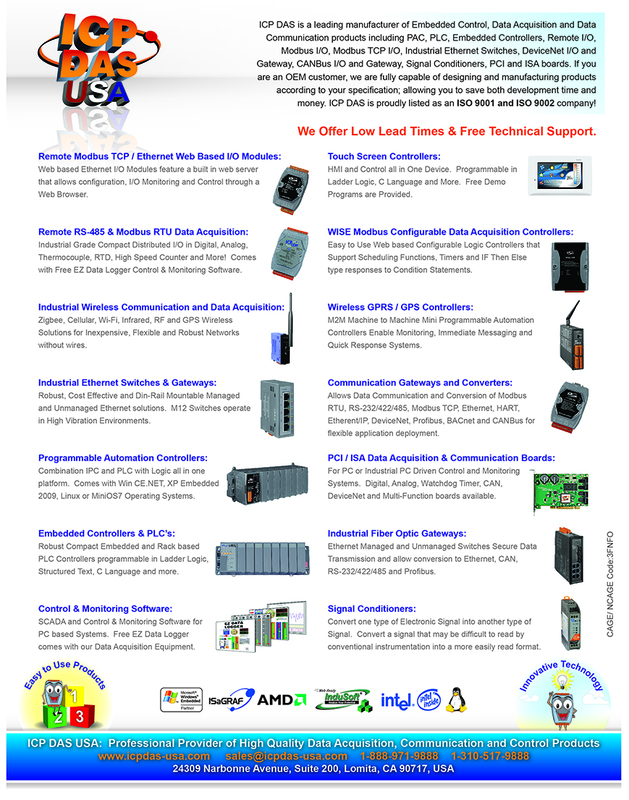 They come with our FREE EZ Data Logger Software for remote monitoring and control.